Warren Road, Rosscarbery, County Cork, Ireland. - 4 bedrooms, 2 full bathrooms. - Can accommodate/sleep 8 people. - Waterfront property located on a safe enclosed marine lagoon. - Beautifully renovated and furnished with traditional beams and flooring. - Downstairs bathroom and sofabeds. - Beautiful Blue Flag 'Warren Beach' with 9-Hole Golf Course and Tennis Courts is a leisurely 10 minutes stroll away. 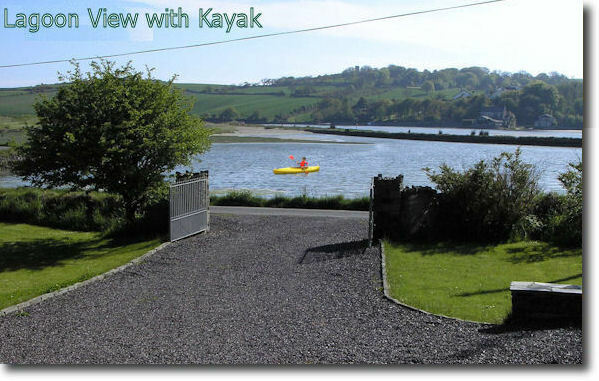 - Rosscarbery village with Shops, Restaurants and Pubs is less than 10 minutes away by car or 20 minutes walking. - Traditional open stone fireplace with working bellows machine. - Oil fired central heating with oil provided for winter breaks. - Free Wi-Fi Broadband Internet. - Spacious Gardens and free parking. - 3 Golf courses within 30 minutes drive at Clonakilty, Skibereen and Kinsale. - No smoking allowed. Pets may be allowed... please speak to us. - Special off-peak offers available ...Contact us for further details. West Cork is a magical place. Local legend states that when it rains in West Cork you never get really wet because "the drops are small and there is lots of space between them" Believe that if you will! but come and experience the magic yourself. To see what Guests had to say and leave your comments please visit our Guest Book / Blog by clicking here. To see an assortment of pictures taken at 'The Anchorage', in Rosscarbery and out and about in West Cork please click here.